We spend much of our time in front of keyboards. Our computer keyboard is an essential interface with the world as it appears to us on our screen. We use keys to input letters, form our words and meanings on a virtual page which can then be fired off in all directions to be read by others at their convenience. We hope that what we ‘say’ via our keyboard will have some impact on other human beings. The piano keyboard offers us another means of interacting with the world. Its keys are lined up in sequence before us and hammers and strings (or their synthesised versions) stand ready to obey the command of our touch. The notes are spaced out equally and pitched to allow us to play broadly in tune in any of their keys. Standardized and reliable; a well-tempered compromise between the 12 keys of the Western diatonic tradition. We simply need to select the right ones at the right time and in the right order to get our message across. The piano keyboard is more elongated and linear than that of the computer and we routinely use more than one key at a time. The effect of a piano key is immediate and its associated sound is experienced in real time. Any single live performance cannot be revised or edited, we can only improve on it by trying again. My familiarity with the piano keyboard predates my use of any typewriter or computer keyboard. I was writing with pencil, pen and paper while also developing a relationship with this complex musical machine with its deceptively simple black and white controls. The keys clearly laid out within reach of both hands, offered a multitude of possibilities if only I could master them. Using a piano keyboard was the precursor to using a typewriter rather than the other way round. As with any musical instrument, playing the piano is a physical experience. The quality of the sound depends on your touch. The player has to press, stroke or ‘tickle’ the ivories to coax the desired effects from their inanimate partner. But the player-piano relationship is not one of equals. The piano may be standing before you, strings tuned, action in good order, with all its potential sounds at the ready, but you…you have the programme and the skill to release those sounds as the composer intended. That person may be long dead, but their instructions are clear enough to allow you to tell their particular story in a way that they would recognise. You hope that story will be as fresh and meaningful today as it was the first time it was told, by a different person using a different keyboard. In the early days, before I could play anything really satisfying, the piano was both drudge-master and toy. One the one hand, there were lessons to prepare for and practice to be endured. On the other hand it was also possible to sit at the piano for ages just messing around, experimenting, tinkling, bashing and exploring the range and limits of the instrument…playing in fact. Scales, arpeggios and finger exercises seemed like so much nasty medicine. They were supposed to be good for you but just got in the way of actually making music. But whatever misery or joy we shared, my piano was always ready for action. It was truly ‘well-tempered’ and if it ever expressed any emotions it was obediently, at the instruction of the human being at the keyboard. Once you get going, you discover that playing the piano can also be sociable. It allows you to provide the support for singing and to become a member of musical ensembles – in my case mainly accompanying my father on the clarinet or my sister on the violin and then later my daughters on the ‘cello, French horn or saxophone. Learning to accompany, to listen to others and create a mood which can enhance the impact of other instruments or enter into dialogue with them can be a great shared pleasure. Learning the piano was, for me, a case of the benefit of being made to work at something worthwhile against your wishes to begin with. A lot of my early practice was unwelcome and I can’t remember my first few years of lessons being any fun at all. I was quite scared of the elderly Miss Galsworthy of Monmouth road, a few streets away from us in Bayswater, who made me look at the tendons which stuck out from the back of her hands in a most alarming way as she played. I remember her tendons but not her music. Much later, after a long and undistinguished climb through the grades I eventually scraped through Grade VIII. But by then I was hooked and needed no encouragement to keep going. In my first year at university I decided to continue with regular lessons for pleasure and at my own expense. I rode my motorbike across London to Crystal Palace where the brilliant Sue Anderson introduced me to lots of new repertoire and a real understanding of technique. Free of any exam requirements, I learnt what it means to properly study a piece, breaking it down note by note and phrase by phrase and then reconstructing it from scratch. I’m still playing some of those pieces today. 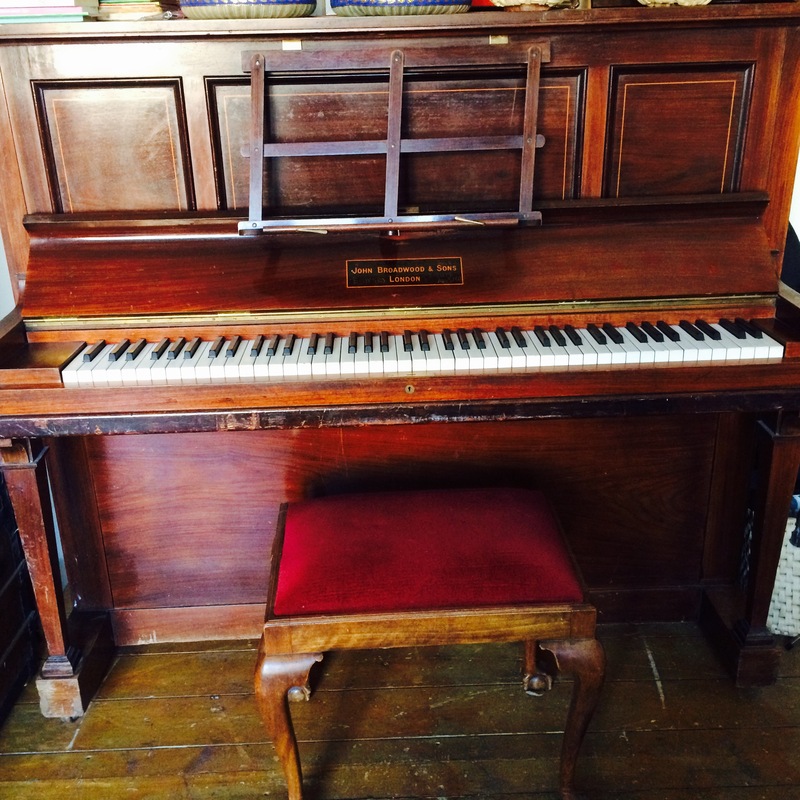 I also still have the piano that I played throughout my childhood; a solid Edwardian Broadwood upright with a massive cast-iron frame. It’s not just a piece of antique furniture, it’s more like my oldest living relative; a valued member of the household. It’s worked hard to keep up with the developing musical styles of the 20th century. It’s been my partner in half a century of musical exploration and has given me the opportunity to concentrate and apply myself to something quite different from anything else I do. These days there’s no drudgery involved. I play purely for pleasure, when I want to and for no one but myself and without any decontextualized scales or arpeggios. But this is far from a casual messing about at the keyboard. Part of the pleasure is the highly focused and repetitive work required to be able to play a whole piece reasonably well. For an amateur with little time, this means practising a very few pieces over a long period, mostly Bach preludes and fugues or some of the easier Goldberg variations. It’s a small but very important part of my life. Our various keyboards are tools, pieces of technology fashioned around our hands to help us communicate better with others. As with any tool, regular use breeds familiarity, confidence and skill. The tool becomes an extension of our body, broadening our reach and impact on the world. On their own, without tools, our hands have a very limited musical potential. But, give them a keyboard connected to an instrument and those hands can really sing. The keyboard is a vital intermediary but in the end it’s all about the music we make and what it does to us. This entry was posted in Culture, Teaching and learning and tagged Cultural heritage, J.S.Bach, keyboard, learning, music, piano. Bookmark the permalink. Thanks Jay. My apologies for the delay in replying and I was on grandparent duty on New Year’s Eve so couldn’t attend your gig. I was in an orchestra in Leicester and have missed ensemble playing since being back in London. Let’s make sure we catch up soon.